Don’t feed bears. This only habituates bears to human food so they will search it out and the next person may consider them a nuisance and that is not good news for the bear. Bird feeders need to be taken down by April 1st or even sooner. Human food is higher in calories than foraged food and this high calorie human food is being blamed for larger litter sizes. Two or three cubs is the normal but in recent years bears are being seen with more and in PA a mother sow was seen with 6 cubs. Bear baiting cannot be ruled out as a problem either. Truckloads of high calorie junk food is used to bait bears every year in NH. NH Fish and Game is doing a good job of educating the public about not feeding bears. It’s too bad it doesn’t include a prohibition on bear baiting as well. From the NH Fish and Game Website: Important: To prevent bears from visiting backyard bird feeders, take down birdfeeders from April 1 through December 1. Also keep all garbage secured, keep barbeque grills clean, and do not leave pet food outdoors. This helps prevent property damage and protects our bears by preventing them from becoming nuisance animals that are habituated to human-related foods. Find out more about living with New Hampshire’s black bears at Something’s Bruin in New Hampshire: Learn to Live with Bears! Incidences of nuisance bears are usually our fault. Bears soon learn, by finding food at open dumpsters, accessible garbage, dirty grills, pet food left outside, and perhaps worse of all, bird feeders, that humans mean food. Such was the case in Hanover, NH when some bear yearlings broke a screen door to a home and entered while people were home. This break-in was the last straw, according to NH Fish and Game, and plans were made to euthanize the mother sow and her three yearlings. But the public wasn’t having it and did what it does so very well when animal lives are at stake. They used their voices, someone started a petition, and before Fish and Game could rid NH of these home invaders Governor Sununu stepped up to the plate and put a stop to the Fish and Game plan. Traps were set to relocate the bears. The three yearlings were trapped and relocated but they weren’t able to trap the mother. Everyone will be watching to see if she comes back in the spring with new cubs. Many think she will if the human food is still available. 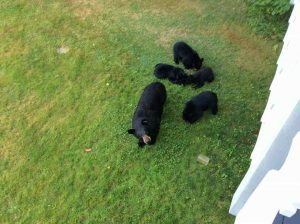 The Jackson Five, a mother black bear and her four cubs, were quite a sight to see for Jackson, NH residents. NH Fish and Game say she was a nuisance bear. Residents of Jackson say that is a lie. Perhaps the truth will come out but does it really matter now? This mother bear was killed by a bear hunter. More specifically she was killed by a hound hunter. She was chased by dogs, cornered, and then shot. A cruel and cowardly form of hunting. It isn’t illegal to kill a mother with cubs in NH. She was still lactating. After getting many calls from people concerned about the motherless cub’s survival, NH Fish and Game did the right thing and captured the cubs. They have been taken to famous black bear expert Ben Kilham in Lyme to be rehabilitated and hopefully returned to the wild. Yesterday I watched a video of the Jackson five. All five came out of the woods near a woodpile. A resident took video of this amazing sight from an upstairs window. They sniffed at the ground for a while then the mother walked back into the woods, with cubs running after her. One cub seemed confused by the quick retreat, stumbling in a circle for a moment, but soon followed. This video clearly shows what this hunter took from those cubs, and from all of us. Comment on file at NH Fish and Game from a Hunter – “HOUNDING we are totally against; this is NOT hunting! What happened to the challenge of being in the woods, 1 on 1, trying to outwit the prey! Hounding divides up the mothers from the babies; it is not fair and it cuts down the future populations because of this factor alone. I’ve seen Bear cubs separated from their mothers because of hounds, where the mother is treed and shot; hence the cubs don’t survive due to their age. Pathetic. UPDATE: The Jackson Five 4 cubs, three females and one male, were returned to the wild in and around somewhere in NH, in and around sometime in June of 2016.